Almost everyone in Japan drinks sake while watching the cherry blossoms, named ‘Hanamizake’ in all their glory during this festival. The initial impression of this sake is a “gentle, velvety, and smooth flavor with continually mild taste that provides a refined image." Sake Bar Kirakuya, a luxurious sake bar in the heart of Manhattan, has announced Ohtouka Nama Sake as the sake of March on the eve of Japan’s famous Cherry Blossom festival. Hanami, a popular custom of this festival, means “viewing of flowers” and specifically refers to the viewing of the cherry blossom flower when drinking sake. As a tradition, the cherry blossom festival is celebrated from the end of March to early May to welcome spring. Almost everyone in Japan drinks sake while watching the cherry blossoms, named ‘Hanamizake’ in all their glory during this festival. 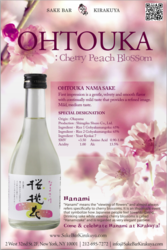 The initial impression of this sake is a “gentle, velvety, and smooth flavor with continually mild taste that provides a refined image.” Ohtouka Nama is a blend of cherry blossom and peach flavors to celebrate the Hanami festival. Kirakuya often arranges such special events and entertainment programs, such as traditional Japanese vocal music program in the bar. Beside the Ohtouka Nama Sake month, the bar continues to celebrate a St. Patrick’s Day with a special event in March. This religious holiday is celebrated internationally by wearing green clothing to commemorate the patron saint of Ireland. 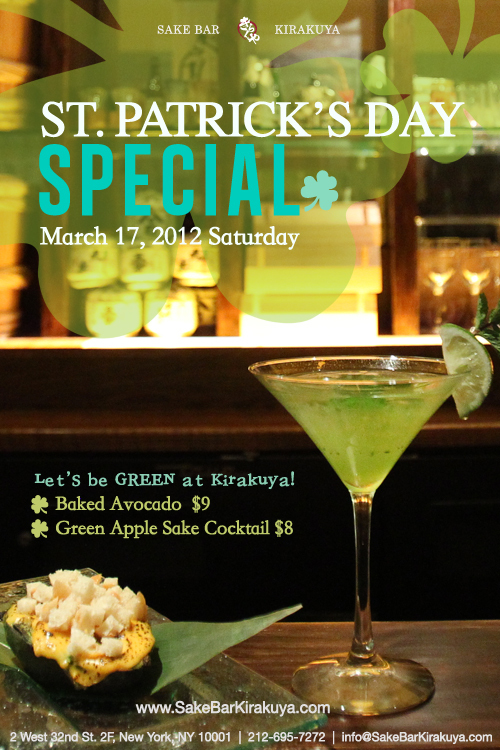 Keeping in theme of this celebration, the bar has announced ‘Let’s be green at Kirakuya!’ as the tagline for the event. The special menu for the event will include green apple sake cocktail and baked avocado. 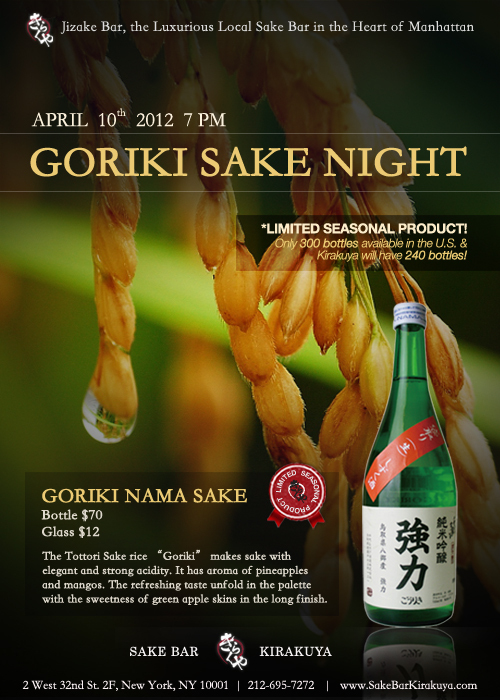 Sake Bar Kirakuya has announced yet another event, Goriki Sake Night, to be held on April 10, 2012. On that day, the bar and restaurant will offer a limited seasonal product, Goriki Nama Sake. Kirakuya will sell 240 out of total 300 bottles of Goriki Nama Sake available in the US. About Sake Bar Kirakuya: The restaurant offers different types of Japanese cuisine, starting from regular lunch and dinner menus to seasonal special and special homemade Japanese style desserts. The bar is also known for the variety of Jizake, local sake selections from Japanese regions.